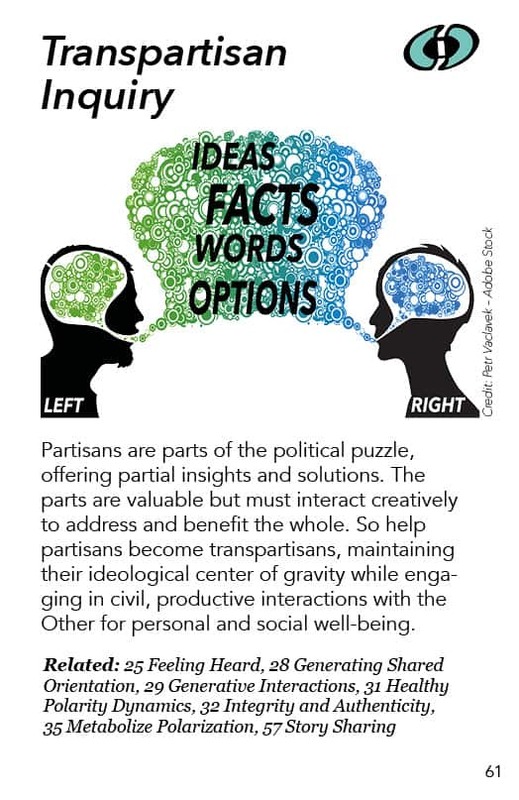 Partisans are parts of the political puzzle, offering partial insights and solutions. The parts are valuable but must interact creatively to address and benefit the whole. So help partisans become transpartisans, maintaining their ideological center of gravity while engaging in civil, productive interactions with the Other for personal and social well-being. This comes out of my knowledge of American politics and to a certain extent the politics of European and other countries. In many places there are two major parties which tend to be identified with the Left and the Right. In a polarized system that tends to be a really good way to frame it. Most of the Left and Right parties have big grains of truth in what they are trying to say. But they are framed in ways that allow them to battle over who gets the power. But I am coming from a collective intelligence/collective wisdom perspective, rather than a power perspective, and looking at the fact that these sides both have a vital part of the truth, if we can get them to not fight together, but to work together, to include the valuable parts of their insights into what gets to be actually done, things that actually make sense rather than wheeling and dealing behind the scenes which doesn’t actually have to do with substantive issues at hand, or negotiation, where people are trying to get the better of each other. This is very different from, “I want to change myself to shake off the partisan of frame of reference totally from my world, and become somebody who is simply seeking the common ground, the thing that will most commonly benefit everybody.” But it’s a very useful stance, and having whoever is partisan maintain this attitude, allows for people to actually work together across major divides and there’s ways to support that. 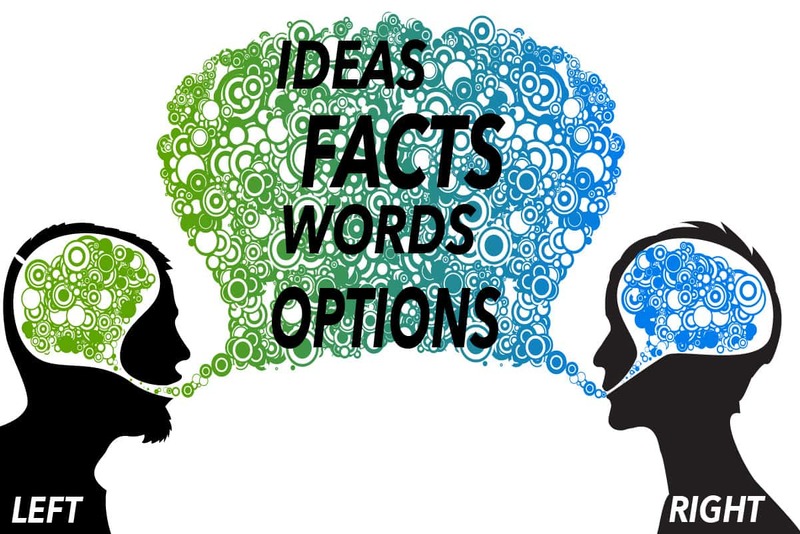 In the book “You are not as crazy as I thought” two people from the left and the right interact in a conversation to clarify what they each believe, listening to each other as best as they can. In Sweden – and I have a blog post about this – they have an Almaden Week, where there’s a big celebration with booths and activities and people who are promoting their political perspectives and their political options, and they organize conversations between these people. It is an actual celebration, people take time off to go and do this thing. And I think they go singing together. It’s one of the most dramatic examples of the kind of transpartisanship that this pattern points to. In the US there’s a “Living Room Conversations” project which involves getting together people from opposite perspectives. You have a person who is a liberal, a person who is conservative, say, the left and right positions. They are friends but sort of ideological enemies. They each bring two or three likeminded friends with them to talk in somebody’s living room, and to try to understand each other. The Public Conversations Project is famous for this kind of event. They have brought pro-life and pro-choice, pro-abortion and anti-abortion people together in conversations through which they actually came to understand each other and worked in various ways to support each other even while they continued doing their partisan activism. The Coffee Party, which is a response to the Tea Party in the United States, is trying to be transpartisan. And the Transpartisan Movement itself. There’s a book of two guys from the National Coalition for Dialogue and Deliberation, one is conservative, one is liberal, and they got together and had two years of conversations and created a book, that said “You’re not as crazy as I thought but you’re wrong anyway“. You can actually watch in this book two people from left and right talking in ways that are actually trying to understand each other. When I read it the conservative guy is very sweet and seemed much more empathic and willing to stretch over the boundary. The liberal guy is fascinating to watch, coming on with a strong progressive perspective. And indeed, I’m just always amazed about the remarkable things served by you. A few four facts on this webpage are the most effective I have had. THere’s an initiative called Better Angels of Trump and Clinton voters talking together which should be on this resource list.